this week marks the one year anniversary of my beloved father's passing. 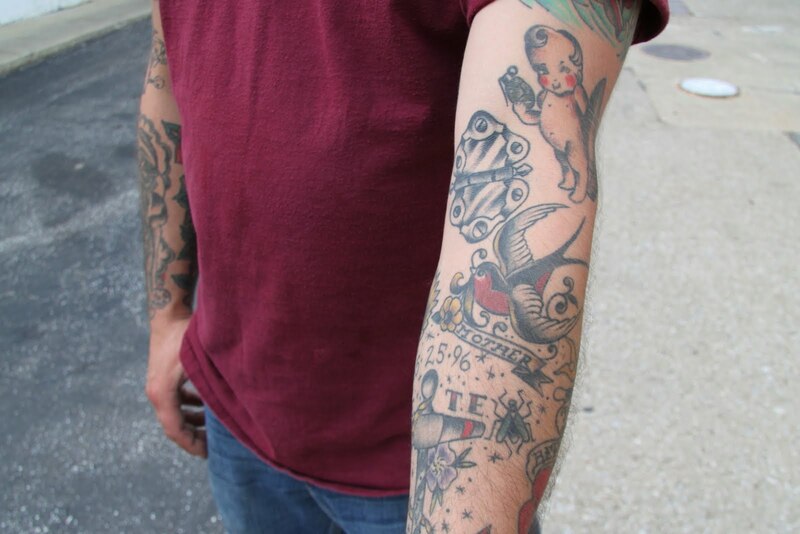 as a tribute to dad, tattoo tuesday celebrates memorial tattoos. 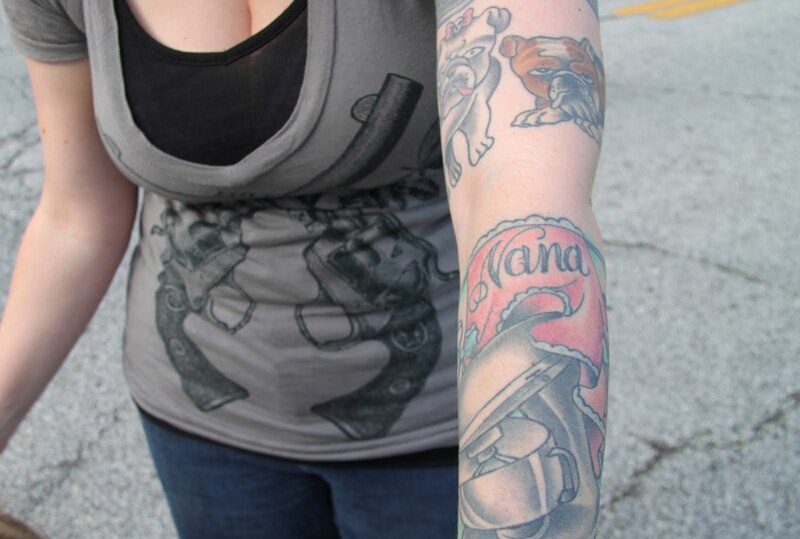 all of the tattoos featured today are on people i met saturday at the lakewood car kulture show. i few weeks ago i stated that next to a tattoo convention, the cleveland irish festival may be the best place to see inked flesh. i was wrong! if it was a race, i think some groups of car enthusiasts definitely win the inked flesh competition! the first two photos are of the left arm of a fellow named dale - there is a lot of stuff represented on dale's arms (and probably the rest of his body too, but i didn't go there) - in addition to glimpses of some of dale's passions (cars & women), there are a few powerful expressions of family love- the top photo shows an anchor - the anchor is one of two memorial tattoos dale has included on this arm paying tribute to his late grandfather (1914-1987); the second is found below - the image of the madonna is a reproduction of a work of his grandfather from when he was an artist at cleveland based american greetings. dale was one three guys i met saturday who belong to a cleveland car club known as the vagabond kings - all three fellows had some really outstanding body art. 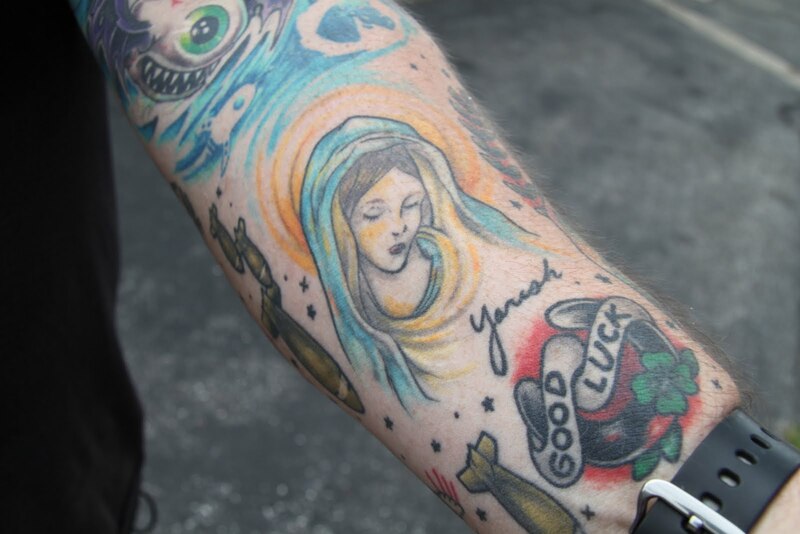 later i met and talked with a woman who graciously shared two memorial tattoos which were not as visible as some of her other tattoos. alas, i was so smitten by her artful body, i forgot to ask her name. on the right side of her torso is a beautiful memorial tattoo in honor of a beloved grandmother - again we find the bluebird. on the left side is a tribute to her father - her father was a marine who served in world war two. below the marine insignia is moving version of the rose of no man's land tattoo. in tattoo culture, the rose (or angel) of no man's land has historically memorialized the women who took care of the men injured or killed in the war - with the rose symbolizing red cross nurses. one final memorial tattoo - below is another in honor of a beloved grandmother - i just love the incorporation of a the kitchen aid mixer - her nana must have been as good of a cook as was my nana! sarah mclachlan singing i will remember you (1995) the song was used in the 1995 film the brothers mcmullen. the song also earned sarah her third grammy. mentioning your dad's anniversary brought images of his pictures and the great love you two shared. Did you get a tatoo? My son had his dad's initials tattooed on the side of his torso, in hopes his dad would walk with him by his side...in spirit. These are beautiful works of art in this post today, and I love the meaning they share. Sending you hugs and love today. May the wonderful memories of the times you and your dad shared while he was here with you be of great comfort to you today. Beautiful song and lovely post. My nephew has a tattoo for a friend and an uncle. I am not much into tats but for this reason they seem like a wonderful way to honor and remember. daisy - although i love looking at tattoos, studying the history and lore of tattoo culture unless my f has a complete attitude reversal i won't be getting any. so for now i will just enjoy other folks body art! karen - i love your son's symbolism. thanks for your kind thoughts. gary - i also find memorial tattoos so profound and moving. ah, my issues with the time-space continuum, or maybe it is my 'date dyslexia' only after this post went up did i realized that the one year anniversary of dad's passing is the 26th not 23rd! the 23rd marks the date of bingo's birth - today he's 8 months old!! ah the continuum of life ...... and me sometimes so easily confused.....but then what is time anyway?! other than something that i'm not good at managing! Aw...has it really been a whole year? Hugs to you. Those tatoos are touching...especially the mom's and nana's. Sweet. Extraordinary images. Anyone who reads your wonderful blog on a regular basis knows of your love of him and your sadness at his passing. 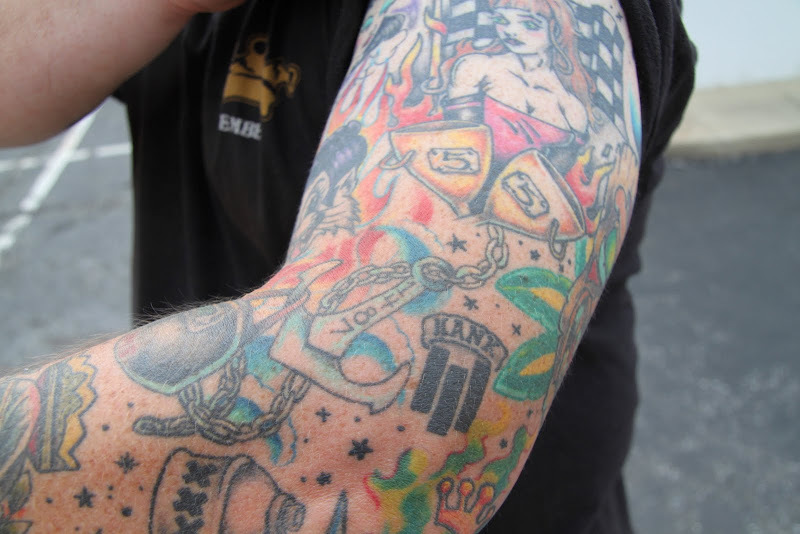 Your blog is a fitting memorial - you have no need for a tattoo. I had no idea that tattoes have their own language of images, but it completely makes sense when you think about it. Thanks for sharing.